Reaching the truck’s toolbox shouldn’t require a leap of faith. 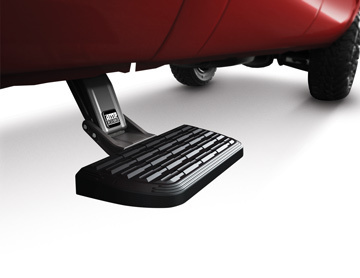 That’s why AMP invented BedStep2™ box-side steps that mount just behind the cab to give a leg up to easily access the front of your truck bed. No-hands operation. Flips down to support loads up to 300 lbs. Features a high-traction, composite step pad for sure footing and high strength, die-cast aluminum, made in USA construction. All backed by a 3-year warranty. So step on it!